In this chapter the evolution of aggression is examined in relation to specific types or forms of conflict, including genocide, hate crimes, and extremism. Three specific theories addressing the etiology of aggression are offered: frustration–aggression theory, observational learning theory, and biological–evolutionary theory. We also revisit Ervin Staub’s contemporary research addressing the origins of extreme group violence and provide evidence of how environmental factors (i.e., styles of parenting and community service activities) may help reduce serious social problems, such as apathy and “bystander effect.” The topic of altruism and prosocial behaviors as personality traits is also offered, with an examination of how community development may address the problem associated with negative behaviors associated with group conformity and bystander effect. 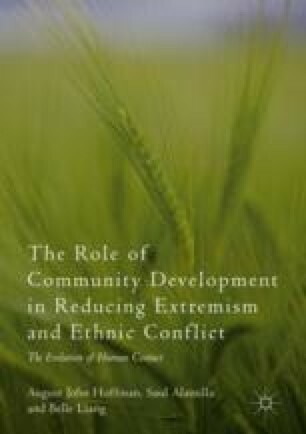 Finally, this chapter will provide evidence on how community development programs can help improve important sociological and psychological benefits, such as community connectedness and community competence.